At Behavior Solutions, we use evidence based practices to help the individuals we work with reach their goals. Our services are available to people of all ages, and we have experience working with people from 0-95. Our services are available in a variety of settings including in natural homes, in the community (after care, day care, etc), in residential facilities, in schools, and everywhere else services may be needed. Our services can help with teaching new skills, reducing problem behaviors, tolerating new foods, sleep training, toilet training, and increasing tolerance to variety of situations including haircuts, doctor appointments, dentist visits, crowds, and much more. We specialize in teaching people the skills they need to live a more productive and meaningful life. We work with people of all ages and skills levels. We use evidence based practices to identify skills that need improvement and teach those skills in order to help individuals reach their goals. Children act out for a variety of reasons and in a variety of different ways. It is not always easy to figure out what to do when you are dealing with these problems yourself. Our team can help you understand why the behavior problems are occurring and teach you strategies to decrease them. Problems getting to sleep and waking up during the night are extremely common, especially among young children. We understand how important sleep is to being successful during daily routines. Our team can work with your family to help your loved one get to sleep at an appropriate time and stay in bed through the night so they can be ready for the day ahead. Social skills deficits are extremely common, especially in individuals with Autism Spectrum Disorder. At Behavior Solutions, we conduct social skill assessments to determine what skills our clients need to work on and then help them reach their goals through evidence based practices. In order to reach these goals, we work with siblings, peers, and community members to help our clients generalize their skills to a variety of different types of people. We understand that it can be very difficult to go on every day errands when your family member or someone you care for exhibits problem behaviors in public or doesn’t tolerate certain environments. We can work with your family to provide structured practice of community outings and help your loved one engage in socially appropriate behaviors while in their community. 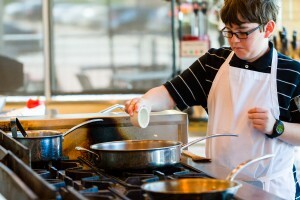 Life skills are the every day skills we use to help us maintain our independence. We understand that sometimes, people need a little extra help learning these skills. Our team can work with you to increase independence in a variety of skills including: cooking, self-care/hygiene, money management, job skills, personal advocacy, shopping, organization skills, and much more. Sign up for more information on Behavior Solutions news and events.